Dining tables always look better with something prettily stitched to decorate them! 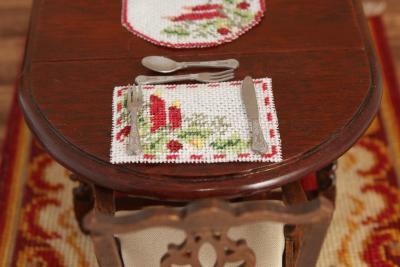 How about making these gorgeous placemats to enhance the dining table in your dollhouse? They are to be stitched on 32 count silk gauze. 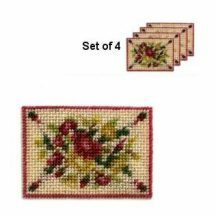 Each kit packet has enough materials to make four placemats. The kits contain stranded cotton, four generous pieces of silk gauze, clear instructions and stitch diagrams, a suitable needle and a colour block chart to count the design from. 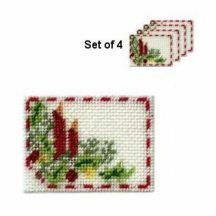 See the description of each design for the exact measurements of each placemat. As the silk gauze is to be trimmed close to the stitching when finishing it, I recommend sealing the edges first, using Fray Check or a similar fabric glue. 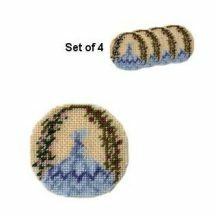 There is a Free Online Tutorial for the placemat kits, which shows in detail how to stitch and finish them.